Only men aged between 20 and 40 were eligible to enlist in the Main Body of the NZEF in 1914, although younger and older soldiers manage to slip through. Recruits had to be at least 162.5 cm tall, weigh no more than 76 kg, and be physically fit. A quarter of volunteers in 1914 were rejected on medical grounds. The first troops to leave New Zealand were members of the force that seized German Samoa on 29 August 1914. Because of the speed with which this force was mobilised, those travelling to Wellington to join it had little time to say goodbye to loved ones. On the other hand, those based in the capital were treated to – or endured – a long line of farewells, including an official function at the Basin Reserve once their comrades from around the country had arrived. During the same period members of the Main Body of the New Zealand Expeditionary Force also began to undergo the first in a long line of farewells – from their home towns, mobilisation camps, and at the country’s main ports. Over the following months and years many more troops were sent off from their homes, communities and the Dominion at a range of formal and informal events. Functions were put on by clubs, schools and workplaces, and there were receptions in towns and cities, both as men left for camp and when they returned home on their final leave before embarkation. Most men who left the country up to 1916 were also farewelled in Wellington - the last port of call for the vast majority of reinforcement drafts. These functions ranged from official receptions at Newtown Park with lengthy speeches by the mayor and ministers, to marches through the city’s streets. They gradually shrank in scale and from mid-1917 drafts simply marched from Wellington railway station to the wharf, where they embarked and stayed on board ship until sailing. The first troops farewelled from New Zealand during the war were members of the force that seized German Samoa on 29 August 1914. At the time of their departure in mid-August, their destination was a secret. They were mobilised following Cabinet’s decision to accept a request from the British government that New Zealand forces seize German Samoa. This assignment was not made public. All that the men, their families, friends and the wider public knew was that a military force was being mobilised at Wellington and that those joining it were likely to go abroad. While the majority of the force came from the greater Wellington area, some specialist units had to draw on men from further afield. Most of these men were farewelled as they left their home towns individually or in small groups. 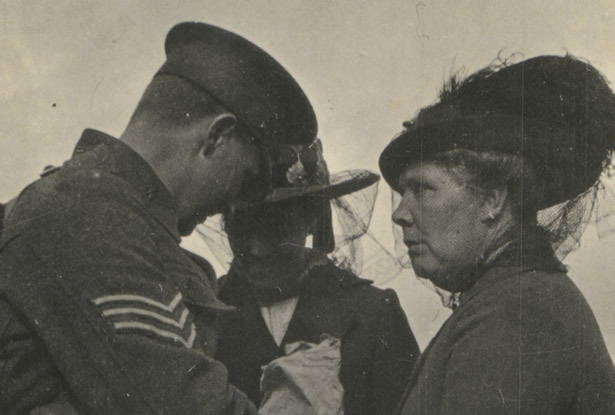 In a scene that was replicated in a number of places across the lower North Island, a large crowd of residents gathered at Hāwera’s railway station on 10 August to say goodbye to a handful of members of the Army Service Corps and the New Zealand Field Ambulance. Similar scenes took place across the South Island as small groups of railway engineers – in total around 100 of a 250-strong contingent drawn from throughout the country – caught the train at various stations on 10 August en route to board a steamer at Lyttelton. The urgency with which the force was required in Wellington meant that many of the South Island men had little or no time to spare before they left for the station. The Otago Daily Times reported that one young man had just half an hour to grab his kit, while another had to notify his father of his departure by telegram. Another group given little notice of their departure was Auckland’s Divisional Signalling Corps, known locally as the ‘College Rifles’. Special messengers from the Defence Department roused members of the corps from their beds on 8 August with instructions that they proceed to Wellington on that day’s train. Not all of them made it to the station in time, with several leaving the following day. But, as elsewhere in the country, there was enough time for a crowd to gather at the railway station to see them off. Despite being given only half an hour’s notice of their departure, about 2000 people gathered to farewell the small group of men. An even larger crowd collected in the streets and at the railway station on the afternoon of 10 August to see off the bulk of Auckland’s contribution – around 250 infantrymen, a group of railway engineers, and cyclists and motorcyclists. The men were met, fed and cheered at other stations as they travelled south. While these men hurriedly caught trains and steamers, Wellington members of the force were being treated to the first of many farewells. With more time than those in other communities, clubs, schools and workplaces organised farewell functions for individuals and groups of men. Speeches, songs, gifts and hearty cheers rained down on them. Louise Brandon, one of seven nurses selected to go with the force, was given a surgical case by her colleagues at the New Zealand Times, where she had been writing the ‘Women’s column’ for the past year. Many stayed to see the ships leave. Family and friends were able to visit the men on the wharf until they embarked later that evening. But although the ships moved off, they didn’t leave the harbour. Whilst they lay anchored offshore, wellwishers made excursions out to the ships in smaller craft. The troopships finally sailed on 15 August after an ‘official farewell’ at the Basin Reserve the previous afternoon. This was the most formal send-off they had received to date, with speeches from the governor, the prime minister and the minister of defence. The public didn’t get much warning of the event, hearing via ‘the man in the street’ or reading notices posted in newspaper offices and shop windows. Nevertheless, some 5000 people gathered at the Basin. Many others cheered the Advance Party as they marched through the city before and after the function. From then on, loved ones waited anxiously for news of their destination and their assignment. But most of the country now turned its attention to the preparations for the departure of the Main Body. As they farewelled members of the Advance Party, communities also began to say goodbye to men joining the larger force that was destined for the northern hemisphere. Shortly after the outbreak of war New Zealand had offered the British government the services of an expeditionary force. By the time the offer was accepted in mid-August the government had begun to organise this force. Men assembled in district ‘concentration camps’ at Alexandra Park in Auckland, Awapuni racecourse in Palmerston North, Addington Park in Christchurch and Tahuna Park in Dunedin. At this stage the public understanding was that they were likely to be sent to fight in Europe. It took the 10 troopships carrying the Main Body and 1st Reinforcements 48 days to sail from Wellington to the Mediterranean coast of Egypt. Along the way they stopped at Hobart and then Albany in Australia, where the convoy was joined by 28 troopships carrying the Australian Imperial Force. It proceeded via Colombo in Ceylon (Sri Lanka) and Aden in Yemen before passing through the Suez Canal to Port Said and finishing the long sea journey at Alexandria. Because this larger force was mobilised from around the country, many places had the first opportunity of the war to farewell their men. These were the first substantial groups that people outside Wellington and Auckland could send off with a real sense of local pride. Towns such as Gore in the south and Waihī in the north staged farewells in mid-August. These were held at railway stations and wharves, but also in community halls, theatres and hotels. The men received more send-offs as they headed to the main camps. For example, men farewelled from Upper Moutere and Blenheim as they left to join the Nelson contingent were honoured again along with the rest of the contingent at the port of Nelson. In the weeks that followed, community groups close to the camps put on functions for individuals or groups of men in the Main Body. As with the farewells to members of the Advance Party, parting gifts were common. Cabinetmakers William Nees and Sons presented a departing employee, Trooper Robert Varley of the Otago Mounted Rifles, with a mount, the well-known cross-country horse, Tarata. This was renamed ‘Highflier’ in acknowledgment of its jumping abilities. During this period the main centres from which the men were expected to depart also put on farewells for their local contingents. To see off the Canterbury contingent, Christchurch citizens held a ‘monster smoking concert’ at King Edward Barracks on the evening of 5 September. In Dunedin a half-holiday allowed crowds of people to attend a ‘civic demonstration’ in honour of the Otago and Southland contingent at Tahuna Park on the afternoon of 17 September. Similar events at Epsom Camp and the Auckland Domain on 22 September and at Newtown Park in Wellington on 24 September were both affected by bad weather but still attracted thousands of people. In Wellington, schools and many businesses observed the day as a holiday or half-holiday and the crowds were estimated at up to 30,000. Many also bade farewell to the troops as they marched through city streets. Dignitaries such as the prime minister and defence minister attended and spoke at these events. Although the newspapers described the speeches as ‘stirring’ and reported that they were received with ‘enthusiastic’ or ‘tremendous’ applause, not everyone was quite so appreciative. Lieutenant-Colonel William George Malone of the Wellington Regiment complained in his diary that the Newtown Park ceremony included ‘too much speechifying and praying’. This time a much larger group of friends and family waited anxiously for news. Over the next four years nearly 50 reinforcement drafts left New Zealand to bolster the New Zealand Expeditionary Force. Like the men of the Advance Party and the Main Body, they were farewelled when they left their home districts. These men often returned home on final leave after completing their training, and were sometimes farewelled again. Christchurch people, for example, followed their farewell to the 5th Reinforcements in February 1915 with a more extended ‘send off’ in May. Composer Paraire Tomoana, best known for the song to soldiers lost in battle, 'E Pari rā', began his wartime patriotic compositions with 'I Runga o Ngā Puke'. Composed for the departing Second Maori Contingent, it was delivered at their farewell at Wellington Town Hall in September 1915. Later in the war Tomoana organised a group to perform such songs in order to raise money for the Maori Soldiers' Fund. Nearly all drafts then received a final farewell in Wellington. The first few reinforcement drafts and the first Maori contingent received a reception at Newtown Park similar to that given the Main Body. But this practice was soon abandoned. In June 1915 the minister of defence explained that there would be ‘no speechifying’ in farewells for the 5th Reinforcements because of the ‘inconvenience’ this caused the men and those making the shipping arrangements. This and future drafts merely marched through the city’s main streets before embarking. Usually next of kin were able to obtain ticket-only access to the wharf to say a final goodbye after the men had embarked, although they could not actually board the ships. Single men were eligible for two tickets, and married men three. Communities in centres outside Wellington missed out on bidding a final farewell to the reinforcement drafts. Auckland, with a training camp at Narrow Neck on the North Shore, did get to farewell the 1st and 2nd Native (Māori) Contingents and their reinforcements, and say a last goodbye to the Tunnelling Company, which sailed for the northern hemisphere from Auckland. But people in other centres generally got to farewell only men from their part of the country, as they left for training camp or after their final leave. By this time the scale of the final farewells in Wellington had been reduced. A portion of the 20th Reinforcements were the last draft to march through the city before their departure, in December 1916. In early 1917 some departing drafts paraded in Waterloo Quay. But this practice was soon abandoned and later drafts marchd directly from the railway station to the wharf, where they embarked and stayed on board until sailing. The introduction of conscription in August 1916 reduced the need for parades as an aid to recruitment. But they were still held when men went into camp, and the main reason for this change may have been an increased concern for secrecy around dates of departure. Not only was there less public spectacle, next of kin were no longer notified of the men’s departure date, nor could they get tickets granting them special access to the wharf. For a time, however, relatives and members of the public who did arrive at the wharf on the day of departure were still allowed alongside the ship once the men had embarked. Nevertheless, the Defence Department encouraged everyone to see final leave as the last opportunity to say goodbye, and tried to schedule this leave just before the men departed. Family and friends could also still come to Wellington to see the men when they had ordinary or weekend leave, or to visit them in camp. The opportunity to see them off as they departed ended in October 1917, when new regulations further restricted access to the wharves. Subsequently the Defence Department arranged for special trains to take relatives and friends to camp in the days before embarkation. Dominion, 13 August 1914, p. 6. Another parade was held on the morning of 12 August from Glasgow Wharf to the barracks. It is unclear if this involved the entire force or just the Wellington Regiment. They were met by the Auckland men at Taranaki St. Evening Post, 12 August 1914, p. 6. Otago Daily Times, 23 September 1914, p. 2. New Zealand Free Lance, 28 November 1914, p. 24. Phillips, Boyack and Malone (eds), The great adventure, pp. 75-6. Dominion, 6 March 1916, p. 6. Press, 5 November 1915, p. 6. Press, 15 November 1915. p. 8. Tolerton, An awfully big adventure, p. 110. Phillips, Boyack and Malone (eds), The great adventure, p. 198. We have 2 events in history, 23 biographies, 40 articles, related to First World War farewells.